Non-refrigerated heat exchangers (also called fluid to fluid heat exchanger) are designed to remove heat from a process and discharge it to an auxiliary facility water supply such as domestic, central chilled water system, or a cooling tower. The facility water source must be at least 10°C/18°F below the required process water temperature to provide a temperature differential (typically 10C). These cooling systems are easy to install and feature a small footprint, modular design and quiet operation since there is no refrigeration and fans involved (air cooled). Non-refrigerated heat exchangers are available with capacities up to 100kW. A process chiller removes heat from a heat source where temperature must be maintained within a narrow region, on a continuous basis. Fluid chillers remove heat based on the principle that heat will move from a hotter source to a colder source – from the process to a conditioned fluid. They comprise two main parts called circuits – a refrigeration and a fluid circuit. The two circuits work in concert to transfer heat away from the process and maintain a reasonably constant process temperature. There are several types of chillers– they are categorized based on the heat transfer medium used and their use depends on the application. A fluid chiller, the most common, is a closed-loop system that recirculates its fluid. A fluid chiller works by generating low temperatures in a refrigeration circuit. A heat transfer fluid flows between the refrigeration circuit and the process where it carries heat away from the process. The warmer fluid absorbed from the process is pumped through a heat exchanger, transferring heat back to the refrigeration circuit and, finally, expelled by a condenser. An air-cooled condenser expels heat, as shown above by blowing cool air across the condenser, moving heat into the atmosphere. A water-cooled condenser expels heat by circulating cool water through lines in the condenser. The water moves the heat to an external cooling source such as a central chiller, domestic water supply, or cooling tower. The main components of the refrigeration system include the compressor, condenser (air or water cooled), evaporator, and the expansion valve. 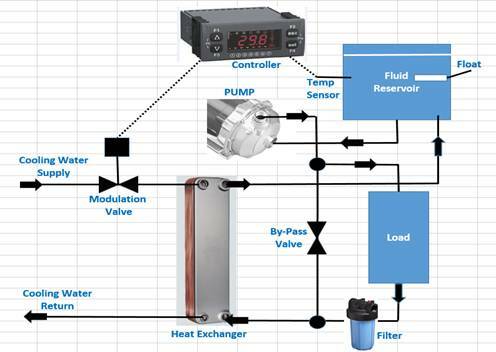 The main components of the fluid circuit include the process pump, fluid reservoir, controller, and the evaporator where the heat exchange occurs. Additional items shown above include the optional return process filter to protect the pump, and bypass valve-installed to provide a process fluid path for the pump in the event that fluid cannot flow to the load. These chillers can implement a variety of refrigerants. Most often, pure water is chilled (fluid chillers), but this water may also contain a percentage of glycol/water, propylene/water, and/or corrosion inhibitors, other fluids such as thin oils can be chilled as well. What is Industrial Chiller Technology? Industrial chillers typically come as complete packaged closed-loop systems, including the chiller unit, condenser, recirculating pump, expansion valve, internal cold water reservoir, and temperature control. The internal reservoir helps maintain cold liquid temperature and prevents temperature spikes from occurring. Closed loop industrial chillers re-circulate a clean coolant or clean fluid with anti corrosion additives at a constant temperature and pressure to increase the stability and reproducibility of liquid-cooled machines and instruments. The cooling fluid flows from the chiller to the application's point of use and back. Industrial chillers control the temperature of a liquid in an open to atmosphere reservoir by constantly recirculating it. The liquid is drawn from the tank, pumped through the external load, and back through the evaporator/heat exchanger to the reservoir. An adjustable controller senses the makeup liquid temperature, cycling the chiller to maintain a constant temperature in the tank. Most industrial chillers use refrigeration as the media for cooling. Water is the most commonly used coolant within process chillers, although coolant mixtures using Ethylene Glycol/Water or Propylene Glycol/Water mixtures are frequently employed to prevent water from freezing at low temperatures, or in outdoor operation. Which Industry or Markets Use Chillers and Heat Exchangers? In industrial applications, chilled liquid from the industrial chiller is pumped through process or laboratory equipment. Industrial chillers are used for controlled cooling of products, mechanisms and factory machinery in a wide range of industries. Chillers and heat exchangers are often used in the plastics industry in injection and blow molding, metal working cutting oils, welding equipment, die-casting and machine tooling, chemical processing, and pharmaceutical formulation. In addition, other industries that apply: food and beverage processing, oncology, paper and cement processing, vacuum systems, X-ray diffraction, analytical equipment, semiconductors, compressed air and gas cooling. They are also used to cool high-heat specialized items such as MRI machines, lasers, and mass spectrometer machines. Chillers and heat exchangers for industrial applications can be centralized, where each serves multiple cooling needs, or decentralized where each application or machine has its own chiller or heat exchanger. Each approach has its advantages. It is also possible to have a combination of both central and decentralized units, especially if the cooling requirements are the same for some applications or points of use, but not all. Chiller Selection - What is Important? Important specifications to consider when searching for industrial chillers include the total life cycle cost, and chiller cooling capacity in tons, BTU's/hour, Tons of cooling, or kW. Process pump specifications that are important to consider include the process flow, process pressure, pump material, elastomer and mechanical shaft seal material. If the fluid temperature is low then a special pump needs to be used to be able to pump the high concentrations of ethylene/propylene glycol, or viscous material. Other important specifications include the internal liquid tank size and materials and full load amperage. 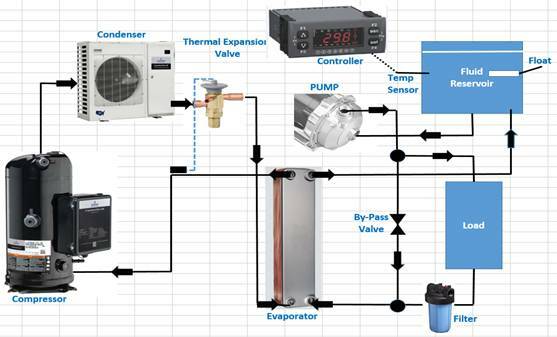 The OPTI TEMP® systems feature our "Advanced Refrigeration Capacity Control" (ARCC) circuitry. This patented industry leading circuitry allows the industrial chiller to operate from "zero load to full load" (without cycling the compressor) while providing excellent temperature stability. Another benefit is the ability to operate over a very wide temperature range from 45°F to 190°F with special materials of construction. A vapor compression chiller uses a refrigerant internally as its working fluid. When selecting a chiller, the application cooling temperature requirements and refrigerant's cooling characteristics need to be matched. Important parameters to consider are the operating temperatures and pressures. There are several environmental factors that concern refrigerants, and also affect the future availability for chiller applications. This is a key consideration in intermittent applications where a large chiller may last for 25 years or more. Ozone depletion potential (ODP), and global warming potential (GWP) of the refrigerants need to be considered. Air Cooled Chillers - How much heat is expelled to the Room? Air cooled chillers, if mounted indoors; add heat at the rate of cooling capacity plus 20-25% additional heat generated by the chiller. Example: If an air cooled chiller has a 12,000 BTU/1 Ton capacity the total BTU load dissipated to the room=15,000 BTU/hour assuming that the compressor is running continuously. Do I Need Corrosion Prevention? OptiShield® Opti Temp's corrosion inhibitor, is a "water based" liquid additive specially formulated to protect "closed circuit" process heating & cooling systems from galvanic corrosion…corrosion which results from the presence of dissimilar metals within the recirculating system fluid path. The OptiShield® products are "water based", have excellent heat transfer characteristics and are normally classified as "non-hazardous". OptiShield® corrosion inhibitors are specifically formulated to control corrosion in cooling systems circulating fluid to industrial machines such as lasers, welders, machine tools and a variety of other process equipment.